I promised the release would happen. Exactly! Me and my partner Viettuan have been working for a long time to make the Final version. The mod has been developing since 2008. You can't imagine how much time we needed to make such a perfect mod like this one! There were sleepless nights and hours of googling, collecting information, pictures and videos... So.. This project is finished as the FULL version with all the pre-planned features and absence of bugs! T.I. was born on September 25, 1980 as Clifford Joseph Harris Jr. in Atlanta, Georgia. He is also known as T.I.P. and "Rubberband Man". T.I. is from the streets of Westside Bankhead Zone 1 in Atlanta. 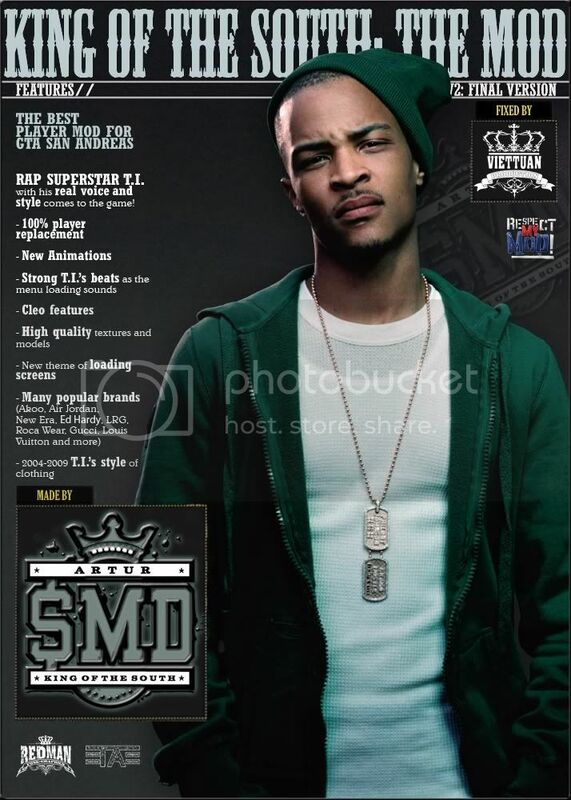 His original stage name, T.I.P., it stems from his childhood nickname "Tip", given by his grandfather. He later changed it to T.I. out of respect for label mate Q-Tip. He was dubbed "the Jay-Z of the South" by Pharrell Williams, T.I. gradually established himself as one of rap's greatest and most successful MCs during the early 2000s. T.I. has always carried a balance of smoothness and toughness, and though 2001's I'm Serious (released on Arista) didn't shoot him out of the gate Ã la Reasonable Doubt, he consistently grew and began a string of major hits with 2003's "24's." From that point through 2007, there wasn't any point when T.I. couldn't be heard within a couple hours on any given urban radio station throughout the U.S. 2003's Trap Muzik, 2004's Urban Legend, 2006's King, and 2007's T.I. vs T.I.P. -- all released through the MC's deal with Atlantic -- were Top Ten albums, and King even spent some time at the very top of the chart. Released in tandem with his debut screen appearance in ATL, King affirmed his status as a superstar. One of the best updates. Styles from the "Front Back" video by T.I. T.I. 's real voice replaces the old one!! Everything is replaced. Nothing old! Many popular brands like Akoo, Air Jordan, Nike, New Era, Prada, LRG, The Great China Wall, Gucci, Louis Vuitton, Carrera, Ralph Lauren, Evisu and so on! KingArt' - you all already know me. The founder of the mod. Did lots of job on everything. Redman" - my main partner who did a lot of texturing job on jeans, tatoos and jackets for the TIP mod v1. The TIP Mod V2 still uses some of his production. =T.A= - my partner who did a great job on sneakers for the TIP Mod V2 I requested him. Some torso textures were also made by him. Viettuan - hero! Fixed lots of bugs an alpha version had and finished CLEO scripts! As you might noticed, the mod was released as the ped version twice. You can try it here! There's the best way to fix the black screen problem. and then the game works. The lamest thing is, some people think that the "TIP MOD V4" is the last version over the internet. But it's absolutely unofficial, is not the release of our team, and is the same V2, but edited in the way I don't like, because of the white skin for the black guy. Some bullsh*t.
TIP MOD V2: FINAL IS THE LAST VERSION OF THE MOD AND THE ONLY OFFICIAL ONE! i will vote it for sure but the download link? "Coming Soon"- the pic said! T.I.P MoD , is back , can't wait to see the final version . Is in this version more full 3d models like your timbers ? Nice! I was waiting for it.I see that you readed my messege. nice man, glad youre back. Vote for the mod at GTAF Annual Awards everybody ! So Fresh,So Fly and always High! Welcome king Read pw... And make this. Chain so heavy dat my neck starts hurtin'! The mod looks too good I don't like T.I. that much but the mod is good. Slim has recently done the new perfect TI's torso model! It's not skinny. Voted once again. Now you should really get that award. btw what's the name of the font you used on the pic? Man look at what I'm doing with your awesome model! TA and Shady - your work TOTALLY destroyed me. I'm going to kill myself now. bye. Ohhh sry my fault i didnt noticed that you both made this man ! @Artur Nice work son,never in my life seen such good model as this got every relased version of it and i am defo downloading dat one too..I am voting for you cuz' you defo deserve dat award playa. @Quechus13 Lookin good you shud ask Artur if you can relase it with credits for head and cap model/texture and fro you for converting and fixing.i would defo download it it would lag my game as f*ck bt still would download it. Made these like half a year ago, you can use 'em if you want to. Might save you some work. holy crap. those are amazing maps. almost jizzed in meh pants.